The IGM-2MB is the truly the production man’s machine. Rigid design and construction stands up to rigorous high-volume production work. The linear slide and ball screw table motion delivers high-speed table movement speed up to 800 ipm. Standard 5hp grinding spindle motor. MDI Control with 8.4″ color LCD display. User friendly control with conversational software. 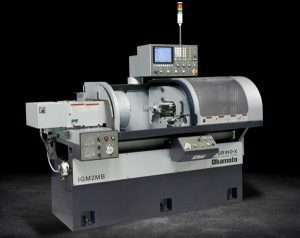 Teach function allows easy set-up of grinding processes.